In anticipation of Ford Championship Weekend at Homestead-Miami Speedway, special edition News & Notes will be distributed each day through Wednesday. 1 – Number of NASCAR Sprint Cup Series titles Kyle Busch has won (2015). 2 – Number of times Kyle Busch has made it to the Championship 4 in the new Chase format (tied with Kevin Harvick and Joey Logano for the most Championship 4 appearances). 2 – Number of top-five finishes Kyle Busch has posted at Homestead-Miami Speedway. 4 – Number of wins Kyle Busch has posted during the 2016 season; none during the Chase (Martinsville-1, Texas-1, Kansas-1 and Indianapolis). 4 – Number of top-10 finishes Kyle Busch has posted at Homestead-Miami Speedway. 7.3 – Busch’s average finish during the first nine races of the 2016 Chase for the NASCAR Sprint Cup. 11.6 – Busch’s average finish during the entire 2016 season. 17 – Number of top-five finishes Kyle Busch has posted during the 2016 season (most among the Championship 4). 24 – Number of top-10 finishes Kyle Busch has posted this season. 95.5 – Kyle Busch’s career driver rating at Homestead-Miami Speedway (third-best among the Championship 4). 103.3 – Kyle Busch’s driver rating during the first nine races of the 2016 Chase. 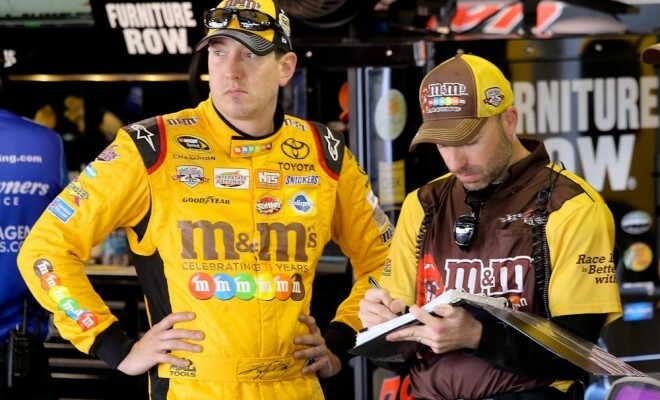 After winning the 2015 NASCAR Sprint Cup Series championship in dramatic come-from-behind fashion, Kyle Busch is looking to become just the 11th driver in series history to repeat as title holder. The most recent driver to do so? Busch’s Championship 4 foe Jimmie Johnson, who won five consecutive titles from 2006-10. Busch would join Johnson as the only drivers to go back-to-back since the Chase was implemented in 2004. There’s something special to note about that list. All but Jeff Gordon (completed his final full-time season in 2015) and Jimmie Johnson (active) are enshrined in the NASCAR Hall of Fame. Heading into the Championship 4 race in 2015, Kyle Busch had never won at Homestead-Miami Speedway. That all changed when he pulled away from Kevin Harvick, also contending for the title in 2015, on a late-race restart and captured the checkered flag and his first championship. In fact, other than the storybook ending to last season, Busch has struggled in South Florida. He posts an average finish of 21.1 and in 11 races at the 1.5-mile track, Busch has two top fives and four top 10s to his credit, including the win last year. Prior to the trip to Victory Lane, Busch’s best finish in Miami was fourth in 2012. Excluding Talladega, where Kyle Busch netted a 30th place finish, he has finished ninth or better in each of the Chase races this year – posting an average finish of 7.3 through the nine races. However, Busch has yet to visit Victory Lane during the Chase while in contention for the title under the current playoff format. He made his way into the Championship 4 in much the same way in 2015 – posting top-10 finishes at all but three tracks (New Hampshire, Charlotte and Talladega). His lone win in the 2015 Chase was the season finale. His clutch performance in the Chase was further exhibited this fall in second place finishes in the cut-off races at Dover and Phoenix this season, which nearly mirrored the results at those tracks in 2015 (second and fourth, respectively). The man atop the pit box for the No. 18 M&M’s Core Toyota, Adam Stevens, is chasing history alongside his driver. Stevens would be the second crew chief since the advent of the Chase in 2004 to win consecutive championships. The other? His Championship 4 rival down pit road – Chad Knaus with Jimmie Johnson. How do you follow-up a hall of fame football coaching career with three championships at the highest level of your sport? With four – and counting – championships at the highest level of motorsports. Coach Joe Gibbs led the Washington Redskins to Super Bowl titles in 1983, ’88 and ’92. His Joe Gibbs Racing stable has won NASCAR Sprint Cup Series championships with Bobby Labonte (2000), Tony Stewart (2002, 2005) and Kyle Busch (2015). Toss in a NASCAR XFINITY Series crown in 2009 with Kyle Busch, and you can state a good case that he has had a second hall-of-fame-worthy career. Coach Gibbs has two cars in the hunt for the title in Sunday’s race at Homestead-Miami Speedway in Kyle Busch and Carl Edwards. Additionally, JGR drivers Daniel Suárez and Erik Jones are in the NASCAR XFINITY Series Championship 4 racing Saturday.